Royal Wheels India is an adventure travel group organising Tamilnadu Tour Packages. Tamil Nadu, the traditional home of the Dravidian culture is located South-East of India. Tamil Nadu has 33 river basins. Prominent among them are the Cauvery, Palar, Vaigai, and Tamaraparani. 44% of the land is under cultivation and 17% under forest cover. On the whole the state covers an area of 1,30,058 Sq.Kms. It is located on the coast. Tamil Nadu is a state of unending beaches, exquisite craftsmanship, strong culture and enduring traditions. The waters of the "Bay of Bengal" kiss the eastern shores in the state. The tip of the peninsula touches the confluence of three water bodies - The Arabian Sea, The Bay of Bengal and The Indian Ocean. The bordering states are Karnataka, Kerala and Andhra Pradesh. The influence of the various dynasties and occupying forces that ruled the state can be seen in its various forms. The Pallavas, the Cholas, the Portuguese, the British, the Dutch and the French have left their impression in different parts of the state. "Tamil Nadu" is a Dravidian name that was given to the state after independence. Dravidian culture is reflected in the dances, the music, and the handicrafts. The influx of the Aryans from the north drove the Dravidians to the southern part of the country. During the Muslim invasion, the Hindu kings of the south formed the famous Vijayanagar Empire. 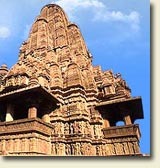 It became the stronghold of the Dravidian culture. The present state of Tamil Nadu was a part of that great empire. The rich culture of the Dravidians not only survives but also thrives in the various customs still prevalent. Festivals here are always combined with some significant, sacred activity. Today, Tamil Nadu is the most industrialised state in Southern India. It is also one of the most sought after tourist destination in the country. Tamil is the official language of the state. Apart from English, Telugu, Malayalam and Hindi and widely spoken. The climate varies from area to area in the state. It is tropical in the western region and moderate in the coastal zones. This city of thousand temples is situated about 76km from Che nnai on the Chennai -Bangalore highway. It was the capital of Pallavas during 6th - 8th centuries and during this period the best temples were built. Later it became the citadel of Cholas, the Vijayanagar kings, the Muslims and the British. 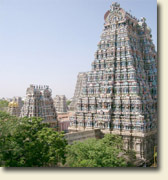 Kanchipuram is one of the seven sacred cities of India. Kanchipuram is also famous for its pure silk fabrics woven from pure mulberry. The city can be reached by rail and road from different places of the state. The nearest airport is Chennai. A city of Contrasts and diversities, Chennai is the forth-largest city in India. Known wor ld wide as Madras until recently, the city was renamed Chennai, evolved from the age-old name, Chennapattinam. Chennai is a coastal city with the second largest beach in the world. The climate is hot and humid. But the breeze blowing from the sea makes the climate bearable. In the summer the temperature reaches up to 42 degree C (month of May). The winter (Dec.- Feb.) is slightly less hot than the summer. Mansoon falls in Sept. - Nov. Chennai is the Capital of Tamil Nadu. 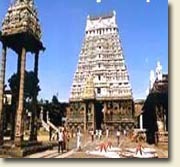 Madurai is one of the ancient cities of the world. Its history goes several centuries before Christ. Tamil and Greek documents record its existence from 4th century BC. The city is situated on the banks of River Vaigai. 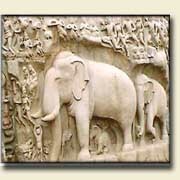 The Pandyans ruled Madurai until 10th century AD. This was the g olden era of Tamil culture, literature and learning. Then Madurai changed hands with Cholas, Pandyas, Muslim rulers, Vijayanagar rulers and finally the Madurai Nayaks under whom Madurai became the cultural center of Tamils. Madurai is situated about 472km from Chennai. One can reach Madurai by road, rail or air. Flights from Chennai, Bangalore and Trichy connect Madurai by air. Kanyakumari is the southern most extreme of the country. The district headquarters is Nagercoil. Nagercoil is about 700km from Chennai. The nearest airport is Thiruvananthapuram in Kerala, 60km away. N agercoil is connected to other parts of the state with rail and roads. Kanyakumari is the land's end of peninsular India. It is in Kanyakumari where the three seas namely the Indian Ocean, the Arabian Sea and the Bay of Bengal meet. On the full moon day, one can watch the sunset and the moonrise simultaneously.